Ubisoft have revealed details of Far Cry 5’s season pass, as well as a new story trailer. The season pass will include three adventures that leave the world of Hope County, Montana far behind. The three adventures are far more in the vein of Far Cry 3’s Blood Dragon expansion than an extension of Far Cry 5’s story. The first, Hours of Darkness, takes players back in time to battle against the Viet Cong in the Vietnam War. The second, Dead Living Zombies, appears to be a B-movie style horde mode game, and the final DLC adventure, Lost on Mars, will take players to the stars to fight against Martian arachnids. 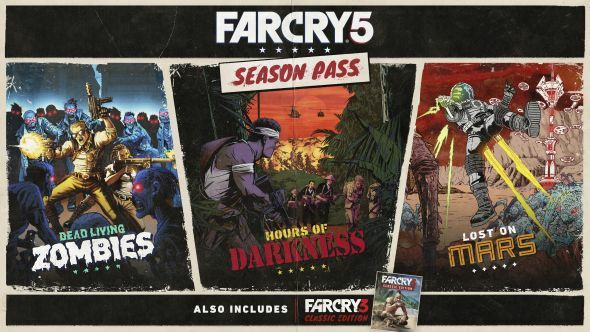 Slightly closer to home, players who buy the season pass will also receive a copy of Far Cry 3 (or the upcoming classic edition, if buying on console). If you’ve not already played it, it includes one of the series’ most iconic villains, Vaas, portrayed by Michael Mando. The story trailer, which you can watch above, focuses pretty heavily on Joseph Seed’s Eden’s Gate cult, and features some pretty grisly stuff done in the name of religion, as well as another look at Far Cry 5’s very good dog. Ubisoft say that more details on Far Cry 5’s season pass, including an overview of each adventure and the return of the map editor, will be shared “at a later date.” Far Cry 5 will release on March 27.